1. I could not be happier with my decision to purchase my GSD from Tia. 2. Whether your search has just begun or you are well into the frustrations of the due diligence needed to find the right dog for you and your family; your search is over....travel no further. We lost our precious Savannah on September 11th, 2018. She was 12 years 6 months old. The loneliness was over whelming for my husband and me. We decided to look for a new puppy to love. I contacted the person I got our Savannah from. She said she would help me find the right puppy for us. She led me to Tia and Dan’s kennel. I loved what I saw and read about these amazing people and their dogs. I called Tia and we spoke on the phone. Tia was welcoming, and answered all my questions. Next I asked if I could come and see her dogs. The answer was yes and I was on my way. We live in Iowa and so I flew and was grateful our nephew lives in Dallas. All my family love animals and all knew and loved our Savannah. Trevor took me to Tia and Dan’s home to see the dogs. We were treated like family and the dogs were beautiful, friendly, respectful, smart, and I was in love. For me to choose a dog that will be my forever companion, I have a process. First I must meet the people that own the parents of the dogs, meet the dog parents of the puppy, and connection with them all. How a dog and their puppies are loved and carried for is the base of their lives and the beginning of your life with them. I can tell you that I have found my connection and have seen the love and care each dog gets from Tia & Dan. Now the puppies are born. Tia puts pictures up as soon as she can. Oh my you want to touch them, hold them and love them. Issy is a super mother, and Canon the best of Dads. I asked Tia if I could come and see the puppies. Yes, and I was planning my trip. You see I need that connection with my puppy. My sister in law was gracious and was my co-pilot driving from Nevada, Iowa to McKinney Texas in one long drive. We left at 7:00 am and got to McKinney, Texas at 9:30 pm. My wonderful Niece and Nephew with Gunner & Goose their large black labs welcomed us into their home. I fell into bed dreaming of puppies we would see the next day. Morning came and we were up and getting ready to drive to Rocklake in the afternoon to see Tia and puppies. I can tell you, it was so joyful to see Tia again and get puppy kisses and play with each one. All the puppies are so beautiful, smart and loving. I asked if I could come back tomorrow and the answer again was yes. “Bliss” We drove back to McKinney and family and told them all about the sweet puppies while playing with Gunner & Goose. We went in the morning and the puppies were waiting. What gracious people Tia and Dan are to let us take so much of their time. My husband and I will be driving from Colorado Springs, CO. to McKinney Texas after Thanksgiving to get our sweet Cheyenne. We will stay with family and drive home to Nevada, IA with a joyful heart and a sweet puppy from Tia & Dan named Cheyenne. This is just the beginning of our story with Cheyenne. We had two dogs, a rescue and a re-home. We wanted to add a Shepherd to our home to grow with our at the time 5 month old son. We wanted to purchase a puppy for this reason. We did our due diligence in researching Breeders. Von der Otto German Shepherds were highly rated so we checked them out. It turns out they are right around the corner from our house. It was a no brainer. We set up a time to meet with Tia and Dan. We arrived at the address and heard no Dogs barking. We assumed we were at the wrong place. Shepherds are very vocal. Dan came out and introduced himself and we went inside. We sat down and started to talk. They answered all questions that we had. They then offered to meet their Males. We jumped at the chance to meet them. They brought out Canon and Aaron. We had no idea any dogs were in the house. Incredibly friendly without being pushy. Sniffed our Son, got some pets and went and laid down. I knew from that moment that I wanted one of their puppies. Their Dogs are absolutely gorgeous and well tempered. We put a deposit on a litter and fell in love with Mattis. We picked him up at the end of May and he has made our home complete. 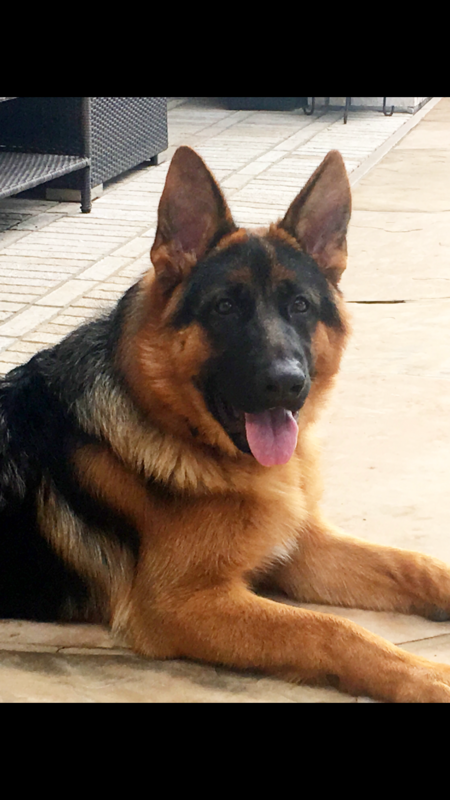 He is a Long coat German Shepherd. The only long hair Male in the litter. He is absolutely gorgeous.He is very well tempered, incredibly smart and is great with our young Son and other Dogs. He is very social without being overbearing. He will get pet then go and lay down and survey the situation. I know that he will be protective when need be and relaxed when not. I cannot recommend Tia and Dan and Von der Otto German Shepherds enough. We have absolutely fallen in love with the breed and will go no where else for any future Shepherds. Thank you Tia and Dan for breeding these amazing Shepherds. You have done very well! We bought Rex from Tia and Dan back in February. He was a beautiful puppy of 8 weeks. Unfortunately, unbeknownst to any of us, Rex had Giardia. Tia and Dan were quick to offer the medicines necessary to clear the parasite and offer to take Rex back and treat him themselves. We chose to treat him since Giardia is common and should have been quick to cure. However, for Rex, it was not. Long story short, 3 veterinarians (including a specialist) could not do anything but common text book treatments. The Ottos researched the problem, contacted their network, found a seldom used medicine, procured the medicine, took Rex back so that he could be treated in their controlled environment, and he was cured after 2 rounds of the treatment. They stuck with us through all of this. His second (important that there are 2) negative test was just received last week (October). 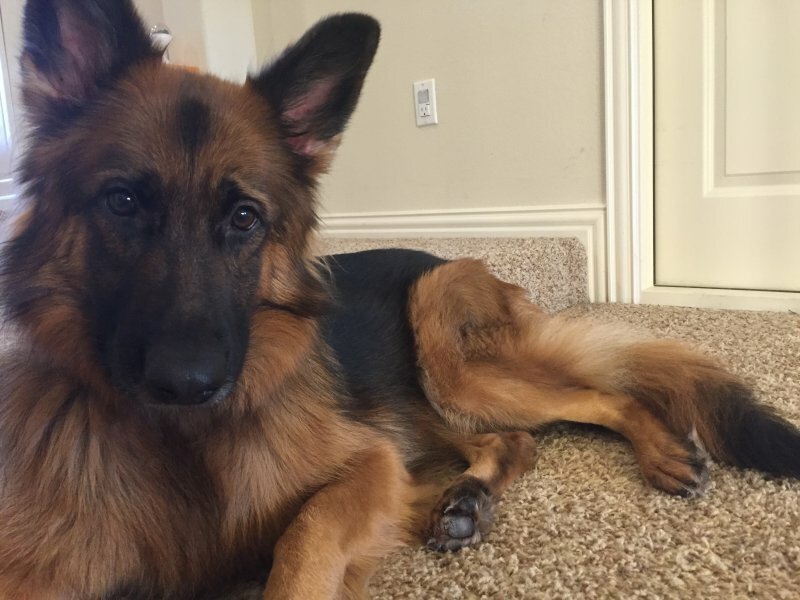 One positive outcome that came from the tests that were run on him during his infection is that he has none of the common digestive ailments found in GSD. We have received more compliments from people about Rex than I have cumulatively heard for all of my dogs these past 50 years of dog ownership. Rex is a great, good looking, smart dog. He has taken to training very well. We couldn't be more happy about him. Most importantly, we are so glad we bought him from the Ottos. They didn't sell him to us and leave us on our own. They worked with us for months until this was resolved, and it was due to them, not the veterinarians, that he got over his giardia. Thanks Dan and Tia. 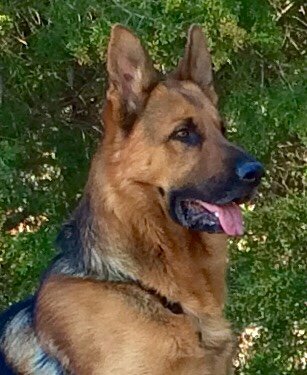 It was 11 years ago when I first contacted Von der Otto German Shepherds when I was searching for a long coat puppy. Tia was very helpful and answered all my questions. I immediately knew I found the right breeder. Tia and her husband Dan arranged to fly my little one to an airport nearby and everything worked out beautifully. My Indie girl is a little over 11 years old now and she has been the best dog for our family. Indie has been very healthy and the most intelligent dog I could imagine. I spent quite a bit of time training her in basic obedience using German language commands. I even put her in a 3 week school whereby she did wonderfully. Tia and Dan have done such a marvelous job with their dogs and have produced many champions as well as quality pets for countless families. I feel truly confident in their knowledge and abilities and trust them and their recommendations wholeheartedly. I highly recommend them to anyone who is looking for the best dogs on the planet. They know what they are doing. They always make themselves available to their customers. My husband and I recently had the privilege of meeting Tia and Dan Otto. After the tragic loss of our beloved German Shepherd our grief was overwhelming. There were days I couldn't get out of bed not wanting to face the day without her. Our little rescue baby was so overcome with grief she looked for her for weeks. My husband talked to Dan on the phone after our loss for 45 minutes. Dan did not even know us but he spent that time consoling my husband. What wonderful people. Two weeks later we were sitting in their living room surrounded by the most beautiful German Shepherds we have ever seen. Tia and Dan welcomed us with open arms to meet the parents of our next fur baby. Our new baby will be born in January. We met her parents, Emma and Nix and it was love at first sight. The dedication that Tia and Dan give to their beautiful babies is absolutely extraordinary. Thank you Tia and Dan for giving my husband and I and our little rescue a happy heart again. We can't wait to meet our new baby. Reader. If you are looking for a “world class” GSD and the Breeder to match, than you are fortunate you have found Ottogsd.com. I have been researching and visiting breeders in both the USA and Canada for 1 1/2 years. My search is over. All “due diligence “ done. Thank you Tia and Von der Otto for being that Breeder, adviser, mentor, and directing me towards this daunting goal. I wanted to provide an updated review now that I have had Wolfram von der Otto for a little over a year. He is a fantastic dog, and absolutely is my heart dog. He is a stunning boy and we get compliments on how beautiful he is wherever we go. He stands out in a crowd and, frankly, loves all the attention he gets. Regarding temperament, he is very stable and alert, very trainable and is great at reading situations. He is wonderful with people and is calm and composed regardless of if we are in a crowd or just with a few people. We will even be testing for his Canine Good Citizen in a few weeks! At under a year old, he earned a VP3 rating at the Regional USCA show, and we plan to go out for more show titles as he ages. However, where Wolf really shines is in scent and detection work. Wolf and I are currently training under a Narcotics K9 handler and Wolf has already earned several detection titles and has the temperament and drive to go very far in detection and scent work. I just love this boy and am so excited to be able to work with him and and watch him grow into an amazing dog. Well done Tia and Dan on breeding exceptional German Shepherds. Wolfram is a son of V2 Ramon von der Grafschaft Mark and Xena von der Otto. I would like to share a beautiful story about our boy Bullitt that is now almost 8 years old that we adopted from Tia. Her German Shepherds are the very very very very best!!!!! He is and always will be my best friend and my super hero!!!! THIS BLEW MY MIND!!!!!!! The most beautiful and amazing thing I have ever seen my fur babies do!!!!!!!!!!!!!! I was out hiking today with my 2 shepherds and 2 Boston’s and MoMo (Boston) fell thru the thin ice of this pond! I heard her fall thru...I looked up and saw her swimming her little heart out and having to break the ice as well...it was a long way out for a small dog of only 15 pounds. I was scrambling to get to the pond to jump in and save her. Bullitt (my shepherd) was there before me so I yelled to Bullitt...get her!!!!!! He knows what "get it" means....but I think he went in out of instinct ...he immediately swam out to her and turned his back to her so she could hang on.....he got her back to shore....Totally blew my mind.....I took my sweatshirt off and wrapped her in it and carried her the 2 miles home...and Bullitt and Count (4 month old shepherd) heeled the whole way back and had me stop every now and then as they wanted to sniff her up, lick her and nudge her to make sure she was ok.....LOVE LOVE LOVE!!!!!!!!!!!!!!!!!!!!!!!!!!!!!!!!! From the first meeting, to questions months down the road, Tia and Dan have been absolutely great. They were very welcoming and very knowledgeable about the breed. They encourage to come visit your pup as much as you can, which really shows in the end. Our boy, Roo, was very sociable with people and other dogs from day 1. He has been such a great addition to our family. 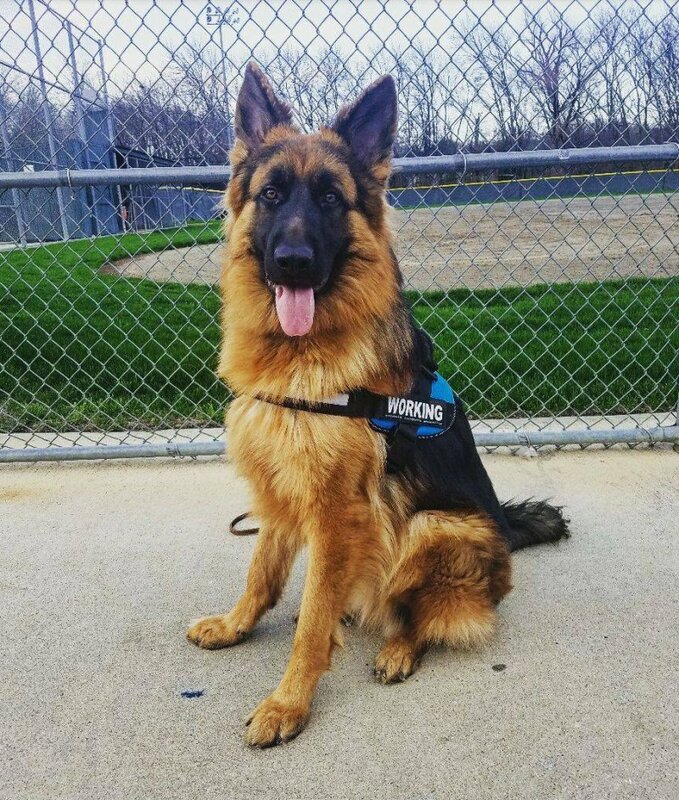 We definitely recommend Otto Gsd!!! It was a pleasure meeting the Von der Otto family and their dogs. They are very helpful and knowledgeable about the breed. We have called Tia on a number of occasions to ask questions about GSDs, and she has always been right there to help us. 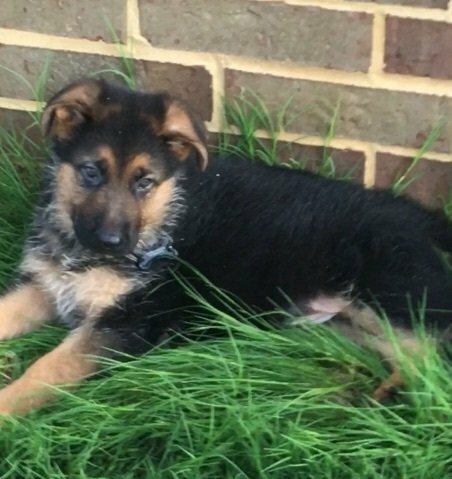 After losing our GSD after 11 years we hunted for months to find the right breeder to get our next family member. We are very thankful we found the Von der Otto family. Our puppy Gracie is an amazing, beautiful, and smart GSD. We recommend Tia and Dan. 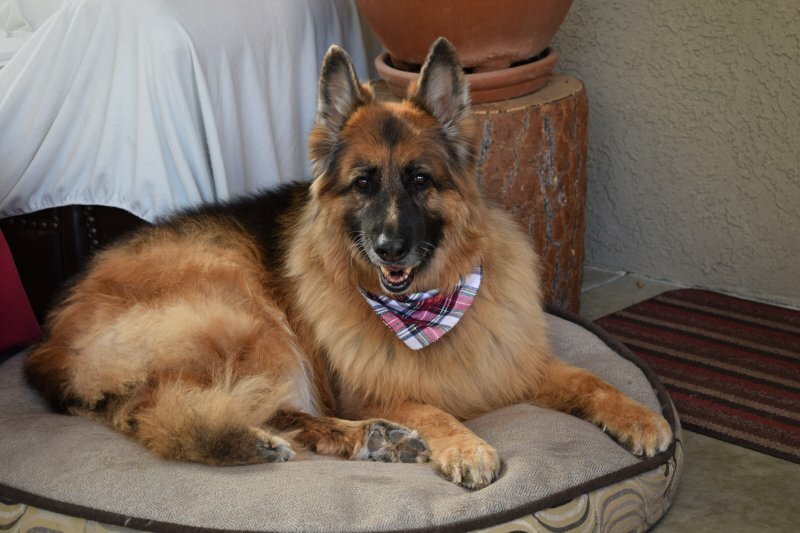 Here is a picture of our Gracie...we get tons of compliments every time we take her out. Evita came to live with us a few months ago. We are so happy to have her with us. She is intelligent caring and is great with other dogs. Thank you so much for her! We love her. I thought I would share a photo of Dallas from the D litter Cannon X Fibi now 10 months old. He is the best! Tia and Dan Otto are such wonderful and beautiful people with just as beautiful dogs. We have never come across anyone with such kind and understanding hearts. They have all the qualities one looks for in a good breeder. Their dogs are like family to them and it reflects in all the dogs' demeanor and personalities. They have a beautiful property for the dogs to run around and their whelping conditions are very well kept and clean. They are very transparent with the way they breed their dogs and have nothing to hide. They answered all our questions patiently and one can see their love for the dogs when they spoke to us. Coming to their dogs, we were able to interact with Nix, Canon, Sadie, Fibi and a bunch of roly poly gorgeous puppies in their house and have never seen more beautiful looking dogs. I personally loved Nix. He was such a gentle giant with a massive and gorgeous head and coat. 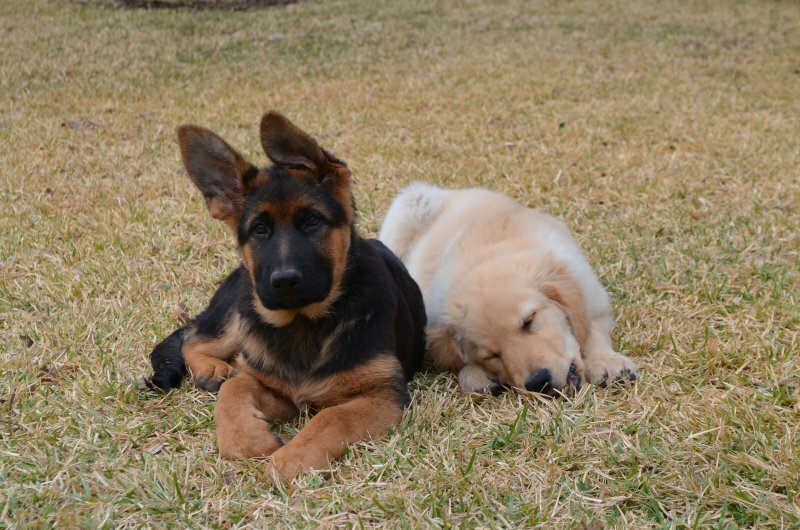 We highly recommend Dan and Tia as the best german shepherd breeders we have come across. They let us visit the puppies every week since they were born until the day we took ours home. They treated us like family and we will definitely come back to Tia and Dan for another puppy. Thank you so much for our beautiful puppy Dan and Tia. Last year I lost my very special male GSD. I searched many breeders web sites looking for an outstanding breeder and dogs to purchase a male pup from. I came across Tia and Dan's dogs and fell in love with Cannon. I consider myself extremely lucky to be able to purchase a pup from the Cannon x Fibi "D" litter. A few things that stood out for me was the fact that Tia posted many pictures of their dogs in various situations whether it be training, competing or spending the day by the pool. Talking to Tia I was struck by her honesty and integrity that many breeders do not have. 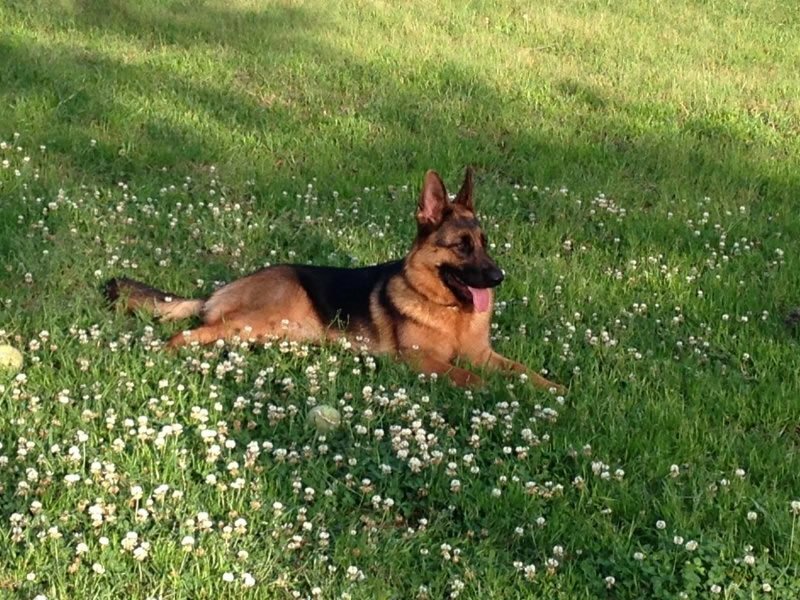 I have owned several GSD and dealt with many breeders over the years, Tia and Dan stood out. I flew to TX from CA to select my new boy and since I had recently moved my 83 year old mother in with me, I now had to select a pup that would be best around her. When I arrived Tia and Dan were like family instantly to me. I was not rushed to make my selection and we talked about many things. I selected Dallas Von Der Otto who has an outstanding Temperament and good mind. He has fit in perfect here and has never jumped on us (which is unusual for a pup) nor was he a mouthy pup. He has already shown he is a good guard dog of the house and property. At 6 months old we are already working off leash heeling etc. 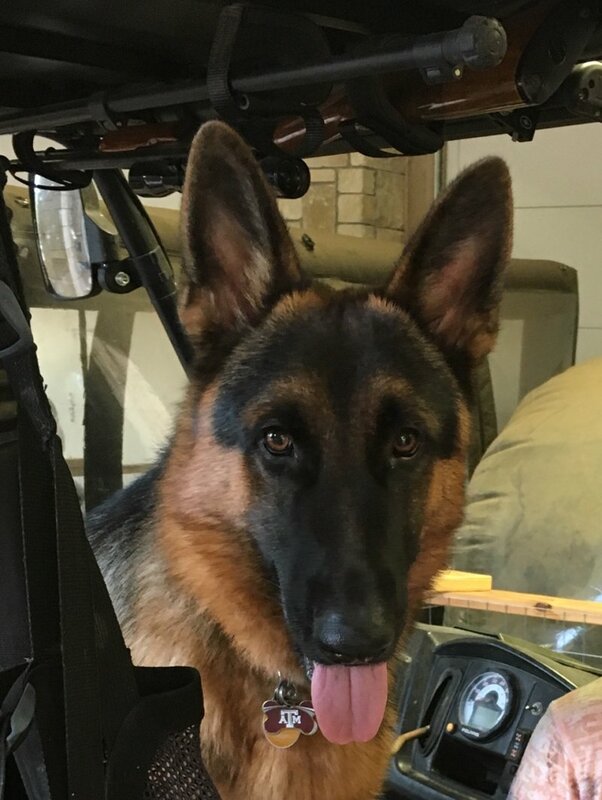 He has been extremely easy to train and many people tell me they have never seen a GSD that was not hyper. A well bred GSD knows when to turn it on and when to chill and relax. That is a well bred dog and good mind. 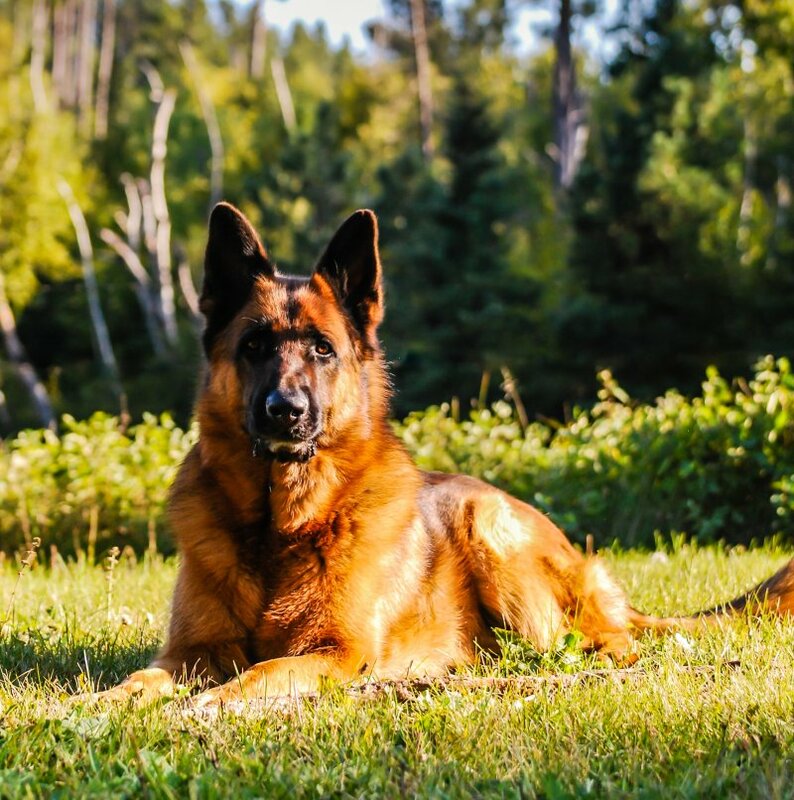 You can buy a backyard bred dog but it will not be as healthy for diseases that plague GSD, have good hips and elbows or a solid temperament and good mind. You get what you pay for and I got and outstanding beautiful dog! I look forward to purchasing another dog from Tia and Dan in the future and highly recommend this breeder! 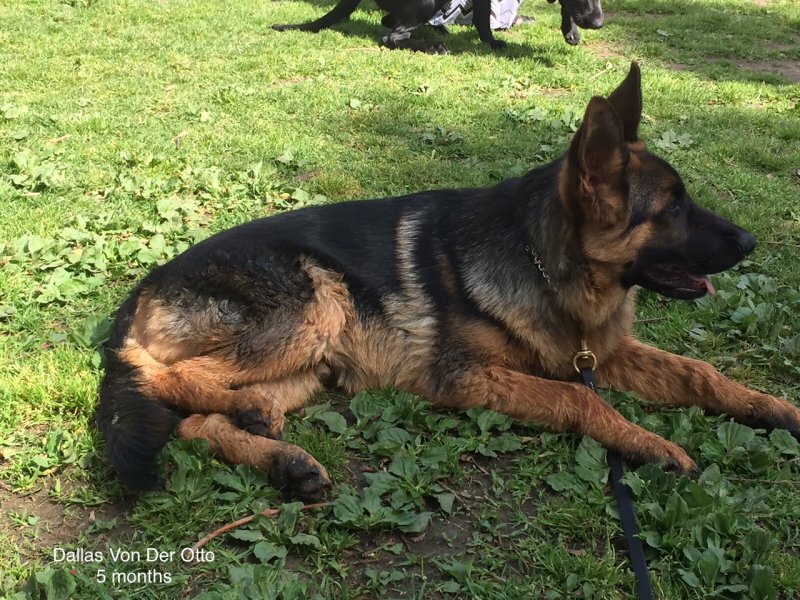 Wolfram von der Otto is 14 weeks old this week and he's just a stunning pup both in personality and looks. He is a son from Ramon and Xena's February 2017 litter, and I could not be any happier with him. On top of having a great, energetic personality, he is very easy to train and catches on to new commands quickly. At 14 weeks we are already working on focused heeling and he will be starting nosework this weekend. We have plans to do rally and other dog sports, and the trainer leading his puppy class is excited about his potential. We are also constantly getting stopped by people who ask to take photos and videos of him. I have had people pull their cars over to ask about him and everywhere we go people comment about how beautiful (and big) he is. He is also the most photogenic dog I have ever met in my life, and several other people have commented on how it is impossible to take a bad photo of him. He is just perfect in temperament and looks and I can't wait to see everything he accomplishes once he's grown. Thank you to Tia and Dan for producing such amazing dogs. I did a lot of research on pedigrees but had so many questions, and y'all answered them all and were always easy to get ahold of. In doing my research, I also saw how truly unique the pedigrees of Von der Otto dogs are. They are very high quality, with world class dogs all down the line and it shows in the puppies that are produced. Thank you again and I will continue to keep you updated on Wolf as he grows! 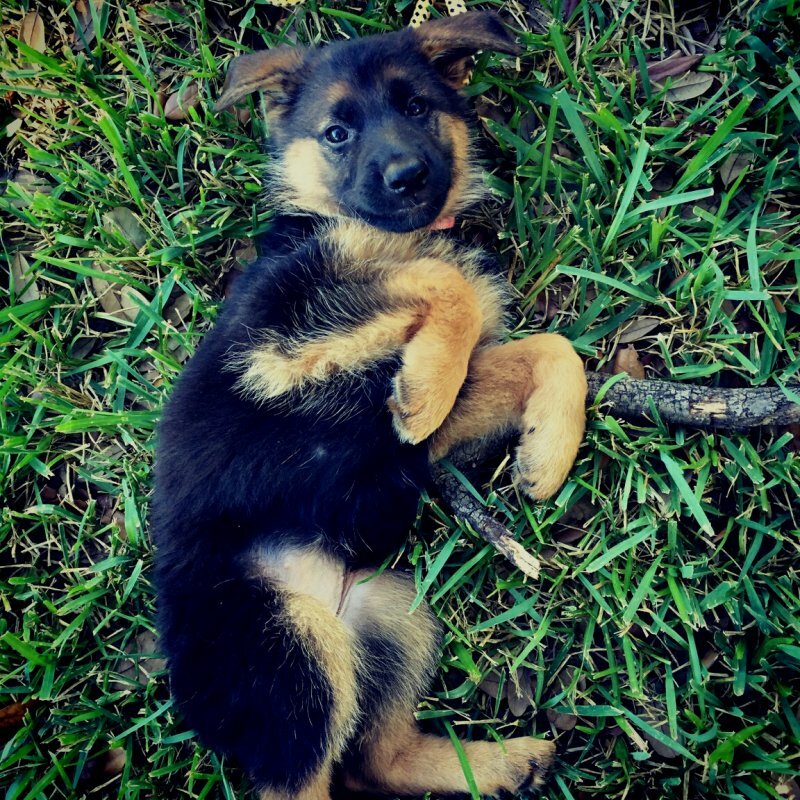 After an extensive search of all respectable GSD breeders in TX there was no doubt in our mind that Tia and Dan were the perfect fit for us. They not only provide esquisite blood lines but all of their dogs have great temperament. My husband and I made a special trip to Dallas to meet Tia and Dan in person. And all I can say is WOW! We were greeted by the most stunningly beautiful group of GSDs I have ever seen. Tia and Dan immediately invited us into their home and introduced us to our future pups mom and uncle who exuded all of the qualities you could ever want in your dog (confidence, playfulness, friendliness, beauty, well-mannered, and perfectly trained!!). Tia's amazing knowledge of the breed as well as her genunine love for her dogs and puppies immediately peaked our interest. One of the most important things we looked for while searching for our puppy was the type of care they received the first few weeks after birth. We were so amazed to discover that Tia and Dan hand birthed and cared for all of their litters right in her home! They not only provide outstanding basic care for their pups but Tia also makes it a priority to spend one on one "cuddle time" with each pup which tremendously helps them with socialization at a very young age. Not only did Tia bless us with an amazing new member of our family she has also been a great resource for questions and help in raising him along the way. Our pup Rikkor is just about 8 months old and he is absolutely perfect!! My husband and I are obsessed with him but it is nothing compared to the inseparable bond he has with our 2 year old daughter! They are truly best friends!! 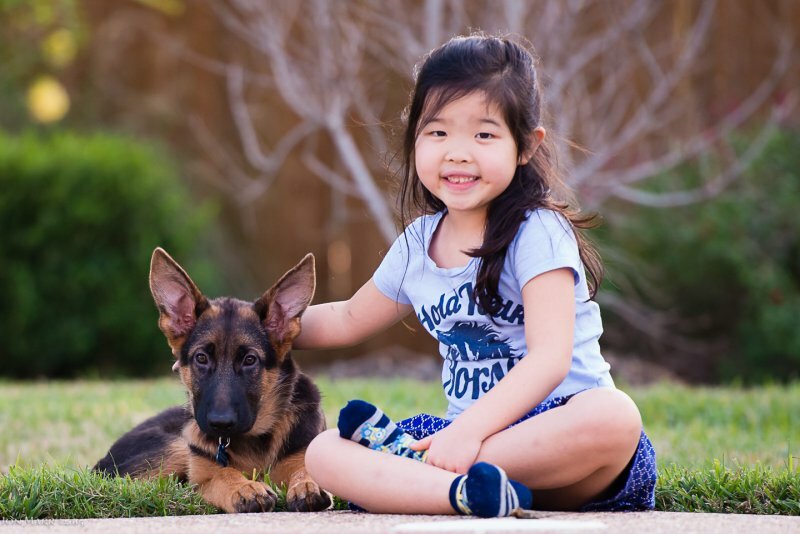 If you are looking to extended your family by adding a GSD we STRONGLY suggest contacting Tia and Dan and making a trip out to their home to see for yourself the amazing quality dogs they breed and the love they have for each and every one of them! Thank you Tia and Dan! I am the proud owner of Payton Von der Otto who is now 6 years old. 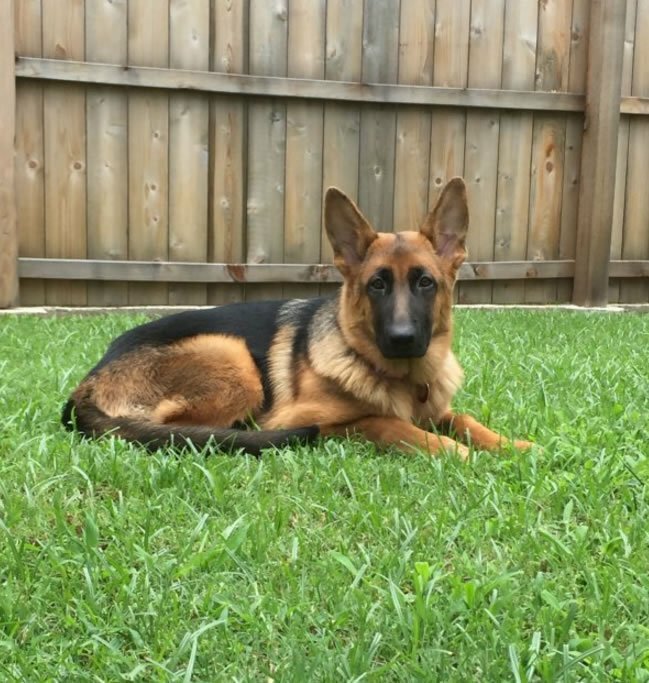 She is truly one of the most beautiful German Shepherds I have ever seen. Although she is smaller than some other shepherds her build and color are amazing. Payton has held at 75 lbs for the last few years. She is dark red and has a beautiful black saddle and is very healthy. I never take her anywhere that people don't comment on how pretty she is. Payton is very protective until she is comfortable that the person is not there to harm her or me. She is very good with my grandchildren and has never bitten anyone. I will send a picture in the near future. First rate breeders with first rate dogs. My puppy's name is Dixi. She is 4 1/2 months old and is just perfect. She is everything a GSD should be: intelligent, loyal, gorgeous and very healthy. She knows all her basic commands and is currently learning commands using hand signals only. She is so alert and willing to please. We have owned two other GSD's that lived long lives, so we knew what to expect from a well breed GSD. Dixi already has far exceeded our expectations. Our puppy is from one of Tia's scholarship litters, a wonderful program. Dan and Tia truly care about their dogs and are very knowledgable and want their customers to have a great relationship with their puppy. Recently on a walk with Dixi, a large vicious dog came charging across the street towards Dixi and I. I put Dixi on a sit stay, her hair was raised and she was making a low growl but stayed completely still. The owner of the other dog eventually got her dog under control and commented on how well behaved my puppy was. I think for a young puppy, her showing such restraint and obidience stopped a potential disaster. If you get one of Ottos dogs, you will not be sorry. I followed Tia's advice and use the vitamins and conditioner she recommends, these are amazing products. Plan on purchasing one of your beautiful male puppies in the not to distant future . Can not explain how impressed I am/have been with Tia and Dan and their German Shepherds. 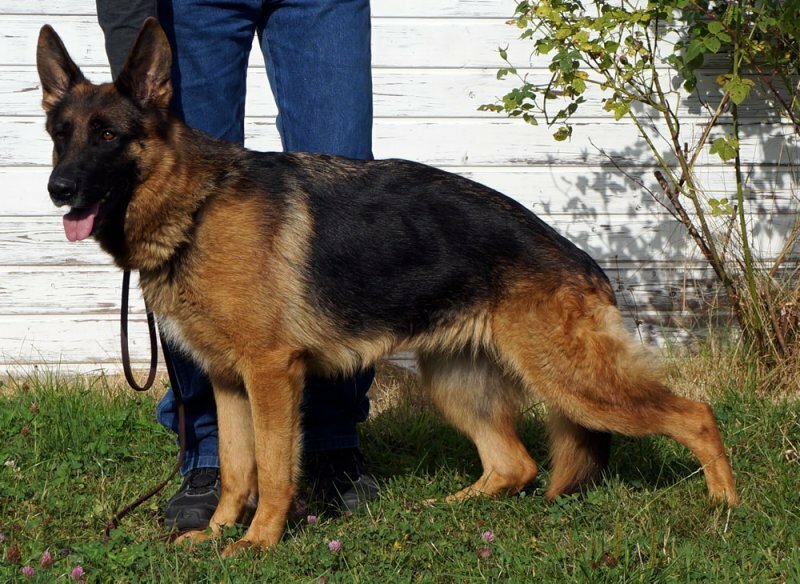 They are first class all the way and are raising/breeding excellent GSD. Throughout the entire process of looking at the puppies, meeting the other dogs, making the purchase, follow up, etc has been second to none. We selected a female back in November, but were unable to take her home until about 3 weeks later due to a busy time with my wife and my jobs. Without question, they took care of her in the meantime at no extra cost and without complaint. Raleigh (my beautiful female) is absolutely gorgeous, has the best temperament, and sweetest puppy. She is growing up fast and is already doing so well with basic obedience training and socialization with other dogs and people. 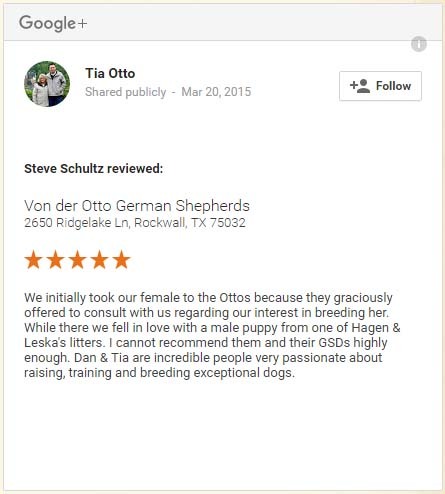 Can't say enough good things about Von der Otto and highly recommend this German Shepherd Breeder. We could not be more pleased with our Von Der Otto puppy. Our girl Ella is the calmest, sweetest dog. She's never been hyper, listens well, trains easily and loves our girls immensely. She's very, very smart and is such a great family dog. She's always been good with kids and other dogs as well. 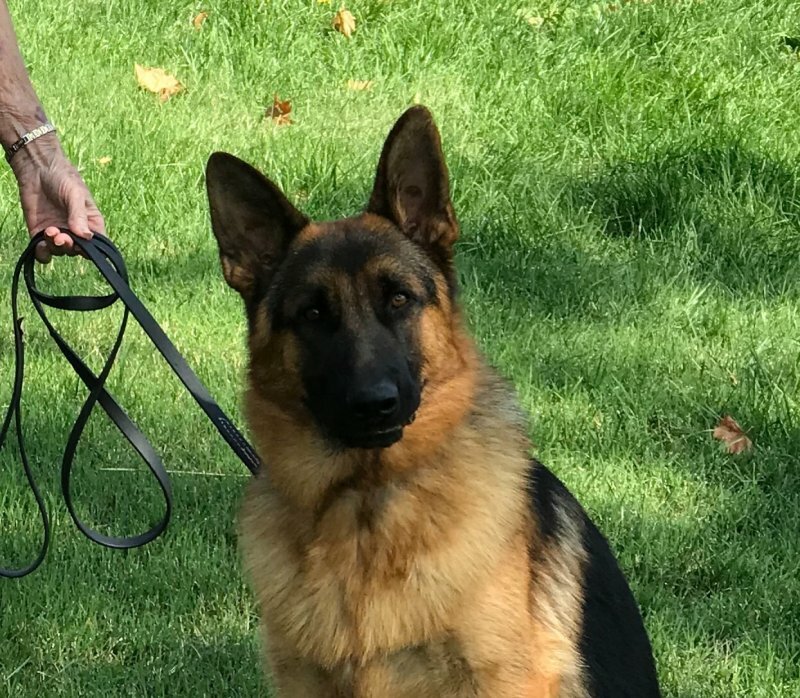 We visited other GSD breeders and the Von Der Otto's were hands down the best around. They treat their dogs like family and it shows. We recommend them highly. This is our first GSD for our family after having labs for the last 20 years. I was looking for temperament, loyalty, protectiveness, and a reliable breeder. 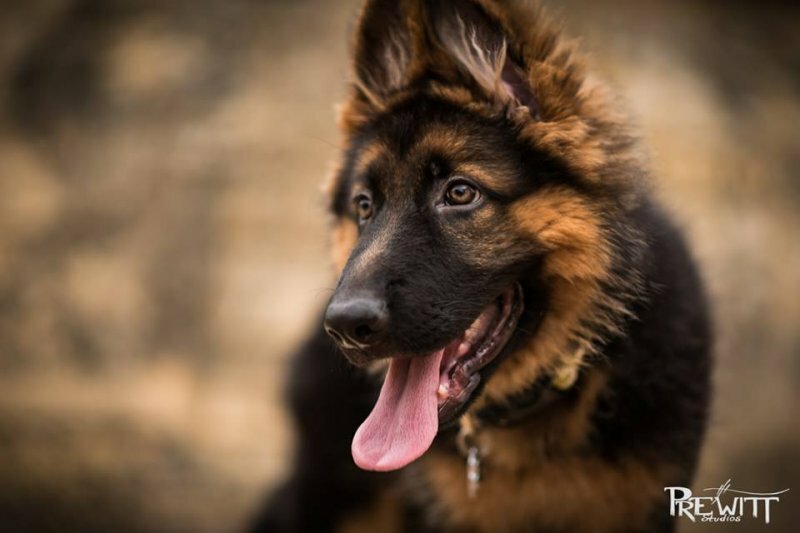 Researching multiple GSD breeders, there were always unhappy clients with scathing negative reviews which of course makes one cautious and hesitant. Finding Tia and Dan was the like hitting the jackpot! Family owned and not commercial. Got to meet both parents (Ramon and Rylie) when I went to look at the puppies before purchasing. Both are very knowledgeable and travel to Germany to continue to learn and develop their passion for GSD's! They are also very responsive to texts, email, and phone calls with questions. 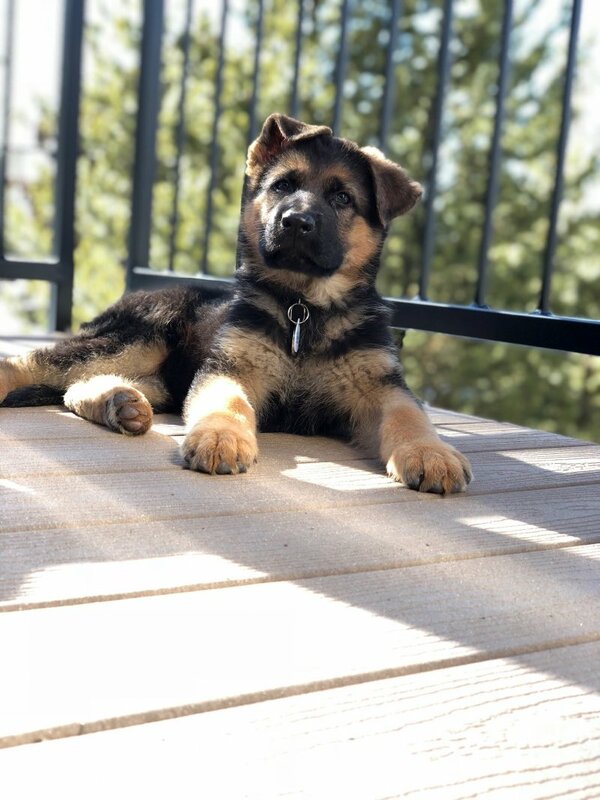 We picked up Jax at 2 months of age and I was amazed at how confident he was. Loud noises would not scare him. He would watch with focused curiosity at the lawn mower, gas blowers, noisy garbage trucks, and traffic noises. I could even dremel his nails at 2 months without him fighting or yelping. Now at 4 1/2 months, he has finished his first puppy class and was the most well behaved in his class. No yelping or fussing. Did what was asked and without protests. Clicker training has worked perfectly! Many law enforcement, fire fighters, and security will comment on Jax during our walks. He's protective of strangers and has a huge bark for a 4 month old puppy. 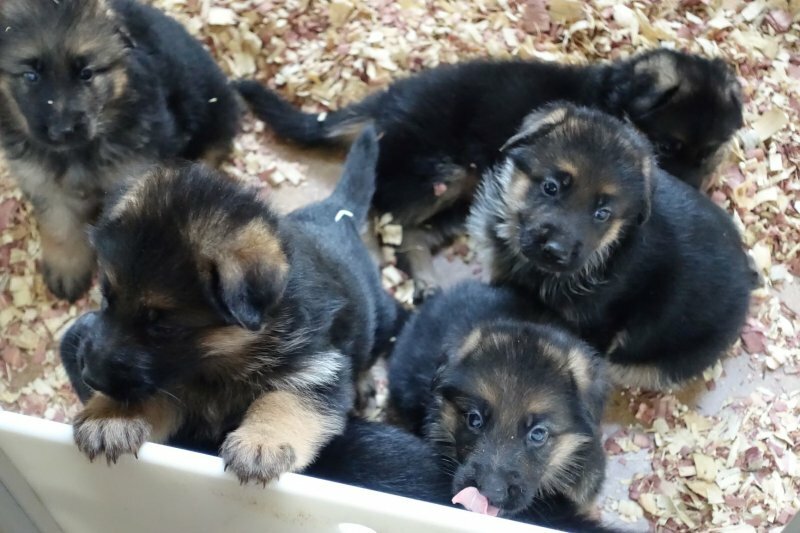 Pricing for von der Otto puppies are reasonable considering all what goes into breeding and bringing quality, healthy, confident, and stable puppies. I have absolutely no regrets on our purchase. We are grateful that Jax has become an awesome addition and we could not imagine our family without him. 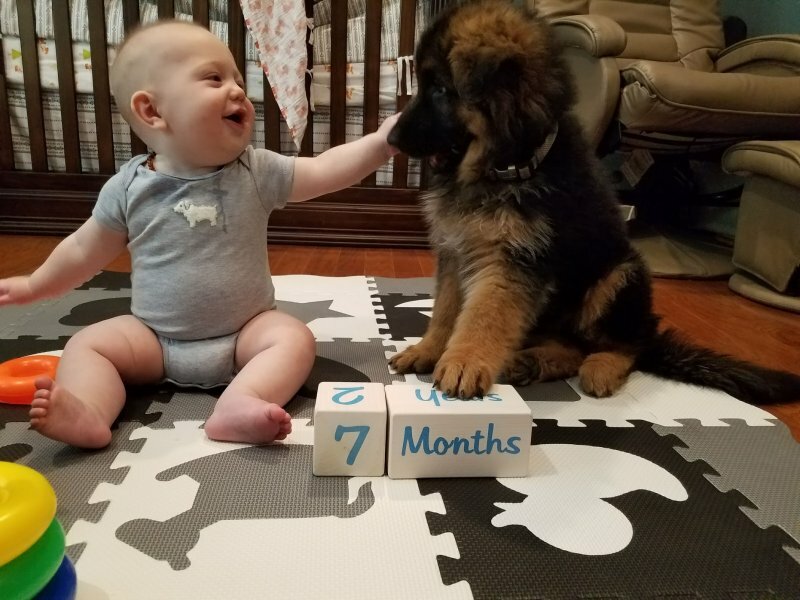 I strongly believe in testimonials and whole heartedly recommend Von Der Otto German Shepherds to others who are considering purchasing a GSD puppy. Take the time to talk with Dan/Tia and you will not regret it. Stop by and take a look at their facility and listen to what they have learned about breeding GSD's. Their heart is in the right place and their puppies will become part of yours! Tia is the BEST!! She has amazing customer service. She cares deeply for her dogs. She is truly a blessing to the world of GSD lovers. I am so glad that we found her. Our trainer said this about our sweet pup..."She's such an awesome little puppy. Truly - I see VERY few shepherds that are as stable as she is. Gives me hope for the breed! :)."